Aims and Scope: The principal aim of the journal is to bring together the latest research and development in various fields of medicine, biology and pharmacy. Rapid publication: Online submission system, electronic peer review and production make the process of publishing your article very simple and efficient. All submitted articles will be reviewed by at least 2 reviewers, and when appropriate, by a statistical reviewer. Authors will be notified of acceptance, rejection, or need for revision within 4–5 weeks of submission. 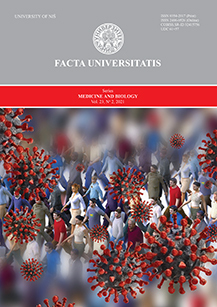 Indexing: The journal FU Med Biol is indexed with M52. All manuscripts are assumed to be submitted exclusively unless otherwise stated, and must not have been published previously except in the form of an abstract or as parts of a published lecture and/or academic thesis. Original papers may not exceed 10 printed pages, including tables and/or figures. Reviews may not exceed 16 printed pages, including tables and/or figures. Case reports/technical innovations/book reviews/presentations from congresses may not exceed four printed pages, including tables and/or figures. Each author that participated sufficiently in the work has public responsibility for the content. This participation must include: a) Conception of design, or analysis and interpretation of data, or both, and b) Drafting the article of revising it for critically important intellectual content. Text should be divided into the following sections and appear in the order: 1) Title page, 2) Abstract and Key words, 3) Main body (Introduction, Material and methods, Results, Discussion, Conclusion), 4) Acknowledgements, 5) References, 6) Tables; and 7) Figure legends. The ONLINE FIRST section of FU Med Biol lists the papers accepted for publication and copy edited but not yet assigned to an issue.